Emily: In my ongoing search for nutrition information, I’m seeing a lot of fairly reckless blanket statements about the incidence of nutrition-based diseases in birds. It seems that the information gets skewed on the internet by people who experience a disease in their own birds and assume that therefore that disease is a lot more common than it is. So I’m trying to find information about true percentages of what avian vets are actually seeing in their practices. The vet I’m currently working for suggested I contact VPI (Veterinary Pet Insurance) and other pet insurance companies to ask them. I plan to do that, although I wonder whether they would actually disclose that information to some random person like me. Do you have other suggestions as to where I might find such statistics? And also, would you mind sharing your own general impressions of the statistics in your own practice? Dr. Echols: These are good questions and I will do my best to answer given the research that is currently available. Some of the pathologists like Dr. Michael Garner and Dr. Drury Reavill have published the incidences of various diseases seen in their practices. Those are probably the best statistics currently available on avian diseases (which include pet birds as well as those in private and public [zoo/aviary] collections). Most of those studies were published at the Association of Avian Veterinarians Annual Conferences over the past several years. Emily: My impression is that hypocalcaemia is actually fairly common, but would you say that most of the bloodwork you run on your avian patients comes back with low calcium levels? If not, what would you say was a ballpark percentage? Dr. Echols: I would say that hypocalcemia is very rare in birds (if not all animals, except reptiles). Hypocalcemia is low blood calcium. Unfortunately, measuring simple blood calcium levels gives a poor indication of blood calcium and even poorer evaluation of body calcium. Ionized calcium blood levels give a better indication of blood calcium but still not body calcium. Even with advanced metabolic bone disease, the body (name your animal) does everything it can to maintain blood calcium levels within a certain range. So there can be severe metabolic bone disease with low total body calcium and normal blood calcium levels. The reason that we see more hypocalcemia in reptiles is that we see so many in severe advanced metabolic disease states (actively seizuring, reptiles just tend to do it slow motion). True hypocalcemia in birds is very rare and is often complicated or exacerbated by other disease processes like certain toxins, drugs, low magnesium and more. Emily: That is very interesting to hear. My impression was quite different because three of my six birds had low blood calcium levels when I got them. But perhaps that’s because I tend to end up with the “hard case” birds that don’t have anywhere else to go? To clarify, are you saying that birds having an insufficient amount of calcium in their diet in general is rare, or that their calcium intake being low enough to elicit clinical symptoms is rare? There is a general concern about feeding foods high in oxalates. I assume you would not share this concern if you felt that the majority of birds’ calcium intake is sufficient? And how do you make a determination whether or not a bird’s calcium intake is sufficient if they are subclinical? systemic process causing the metabolic system to go haywire that may all contribute to a truly depressed calcium. all probability his blood calcium levels were low because in addition to all of that, he also probably had low magnesium and/or toxin exposure–which is highly likely since he lived in the kitchen of chain smokers who burned dozens of scented candles in their house and used non-stick pans in their kitchen. The bird, his cage, and everything in it were coated in layers of nicotine and wax. Do I understand you correctly? That the low blood calcium levels were most likely due to exposure to toxins and low magnesium in his diet, rather than simply low calcium alone? And short of such drastic examples as some of the birds I’ve gotten, like the BHP above, how can the average bird owner tell if their bird doesn’t have enough calcium in their diet if the birds are subclinical? Dr Echols: Emily you are almost there! Most pet birds will have normal blood calcium levels while on a calcium deficient diet up to a certain point. When bones become soft (and you can shine a light through the beak like yours!) the animal has more advanced metabolic bone disease. Even at that point, without other complicating factors (toxins, low magnesium, etc), only some birds will have low blood calcium. A few will have true hypocalcemia. And yes, low magnesium (which may also be due to diet), lack of sunlight (and presumptive low vitamin D levels), some toxins and probably other factors can further exacerbate low calcium levels. So how does one know if their bird has metabolic bone disease and low total body calcium??? More accurate non-invasive tests such as bone density studies are not readily available for pets (however they have been done in research settings). Also bone biopsies to measure bone density and total calcium content can also be performed but are invasive and again primarily limited to research. So we can only give a presumptive diagnosis based on radiographs (X-rays), bloodwork (which can include calcium, ionized calcium and more), diet and sun history and our physical examination findings. In other words, we have to look at the whole picture rather than rely on one test to make a diagnosis of low body calcium. Emily: Another impression I have gotten is that cardiac disease due to high-fat diets is rampant–particularly, I suppose, from the information that you, Dr. Echols, posted on Nutrition For Pets about the extremely high incidence of cardiac disease in captive Greys and Amazons over 10 years of age. Would you say that your experience is consistent with that information? vitamin D, certain infections, etc) as with humans. conflicting research exists in human nutrition, but I’ve been finding a lot of research lately about simple carbs playing a much larger role in atherosclerosis in humans than fat and cholesterol. It was interesting to hear you draw those parallels for birds. Emily: What about hepatic lipidosis? How frequently would you say you see that in birds in your practices? Is it as high as The Internet would lead us to believe? Dr. Echols: While I am not sure what the internet says, I almost never biopsy a bird’s liver that I believe has just hepatic lipidosis (to confirm the diagnosis). There is no reason to prove fatty liver if the bird’s diet and exercise program are not in line. The last thing I want to do cut open an obese bird to prove it is fat. To say a bird is fat is one thing. To say a bird has fatty liver disease requires a biopsy. For that reason, I have no idea how the ‘internet’ can claim a frequent diagnosis of fatty liver in pet birds when we infrequently make that definitive diagnosis. With that said, we certainly perform necropsies on birds that die with fatty liver. In my experience, it is uncommon to rare to necropsy a bird that has died just with fatty liver. probably have some degree of fatty liver disease. Again, I am going to put these birds on a diet and exercise program first. If the diet and exercise are adjusted appropriately and we still have evidence of liver disease, then I will consider a hepatic biopsy to better sort out the problem. only caused by the factors above but also can be found alongside other liver lesions due to toxins (especially aflatoxins and other mold toxins), normal reproductive activity, abnormal reproductive activity and others. So not all of these are going to be responsive to diet and exercise alone. To now answer your question, I don’t know what the incidence of purely dietary fatty liver disease is in pet birds! bits of meat to your bird they will die of fatty liver disease. And obviously, as we have discussed many times, it’s all about moderation and meeting your bird’s actual caloric needs based on activity level, breeding status, species, individual health, etc., so I’m not trying to imply that those concerns are invalid. I just often wonder what the actual incidence rate is. slightly low calcium), so there’s no reason to suspect any other underlying liver disease. I’m not asking for any online medical advice about my bird; his situation just made me wonder whether you see these fatty liver issues in underweight birds. Dr Echols: Back to the first part, I cannot give you a true incidence of fatty liver disease. One estimate suggests that less than 10% of the pet birds see a veterinarian. In general, veterinarians see animals that tend to be healthier than average simply because those pets are receiving preventative or therapeutic medical care. So I am saying that while veterinarians see ‘X’ percentage of cases of fatty liver disease, I bet the incidence is higher for the 90% that never get examined! Part II: Yes a bird can be ‘thin’ with fatty liver disease. First we need to clarify ‘thin’. Most people consider the presence or lack of pectoral muscle mass the defining feature of whether or not a bird is in normal ‘body condition’. Body condition and pectoral muscle mass are two separate features of birds. Body condition refers more to the presence of body fat and pectoral muscle score is related to breast muscle size and condition (soft, firm, etc). A bird can be overweight (high body condition score) and have poor pectoral muscle mass (low pectoral muscle score). This is common with sedentary birds that don’t fly (and subsequently don’t exercise their breast muscles). The opposite can be true in birds that have relatively low body condition score with a higher than average pectoral muscle score. This is common in performance (show) birds that are lean (limited fat reserves) but build up muscle through training or working. 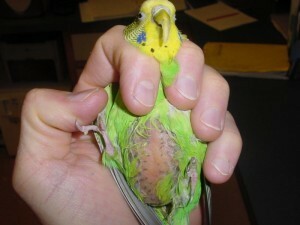 This is also common with some of the healthy wild parrots I have examined. Your bird could be somewhere in-between: normal body condition score with decreased pectoral muscle score. To expand upon your original question ‘do you ever see dietary-induced fatty liver in birds that are in a low to low-normal body condition range–’… Fatty liver disease is not only caused by a poor diet and sedentary lifestyle but also by some metabolic diseases, some normal physiologic processes (reproductive activity) and numerous toxins. In my experience, birds with dietary induced or reproductively active hens with fatty liver disease tend to have higher than average body condition scores. Birds with metabolic diseases and toxin induced fatty liver diseases tend to have decreased body condition score. These are only generalizations as many exceptions exist. a vet and to pay attention to what they feed their birds. So what I’m curious about is not necessarily the incidence rate of companion parrots in general, but specifically, the incidence rate among companion parrots whose owners are relatively knowledgeable and conscientious. What is the “fail rate” among people who are trying to feed their birds well? What are the true numbers of birds who are getting these diseases despite their owners’ attempts to feed them a fresh, varied diet? Is most fatty liver happening to birds on a seed diet, or is it even common among birds who are getting any combination of pellets and fresh foods? As we’ve discussed above, that’s not such a simple or easy answer, but that doesn’t mean I’ll stop wondering! Dr Echols: By far, birds on a predominantly seed based diet have a greater risk of fatty liver disease. The true incidence of fatty liver disease in pet birds is not known. Emily: And what of hemachromatosis, or even just moderately excessive iron levels? How frequently do you see that outside of the species who are known to be prone to it like Lories and Toucans? Dr. Echols: Another interesting question. I still see a lot of lories and toucan family birds. However, I rarely see hemachromatosis in these birds now. I used to see it a lot 10 years ago. My feeling is that the diets have improved and the general knowledge of those who care for these specialized species has improved and now hemachromatosis is less common with these birds. Now, I more frequently see hemachromatosis in other parrot species- for whatever reason it is more common in Amazon parrots in my experience and pet starlings (which we already know are prone to hemachromatosis). Emily: Again, very interesting. Do you feel like you saw hemachromatosis in Amazons in the past? In other words, do you feel like the incidence rate is increasing for some species? If so, have you noticed a common thread in how and what these birds were being fed? Dr Echols: I don’t think the incidence of hemochromatosis is on the rise in the ‘atypical’ species but I definitely see fewer ‘high risk’ species with the disorder than I did in the past. Emily: How frequently would you say you see gout? I’m particularly interested in the rate of incidence outside of species who are prone to it like Budgies and Pionus. Emily: Wow! 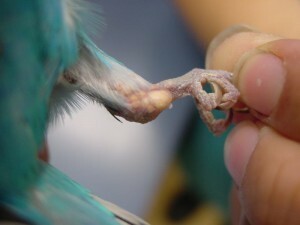 Every website, breeder, and book about Pionus I’ve found harps on gout as if it is super common in them! They harp on the importance of a low-protein diet, so I’ve been feeding my Bronze Winged like my Ekkies. I know you can’t read The Internet’s mind, but do you have an idea as to the source of the widespread protein phobia that swirls around? I do know some people with birds who have had articular gout, and I remember seeing a couple of cases at various clinics I’ve worked at, but I suspected it wasn’t as common as the general chatter would lead us to believe. Dr Echols: You’re right, I cannot read the internet’s mind! However, I think I understand the origin of this idea. First, kidney disease is very common in birds. If left untreated it often results in end-stage kidney disease and gout. So if the bird was acting fine (or was just not noticed) until the very end, gout may be seen. At that point, the kidneys will be too fried to determine the original cause- just chronic kidney disease and gout. Second, the older veterinary literature states or suggests (depending on the source) that high protein diets either contribute to or cause kidney disease (in mammals). We now know the high protein-kidney disease relationship is not that simple. However, that idea carried over into bird medicine. Many studies have looked at feeding high (even up to 60 and 80%) protein diets to many bird species (including parrots) for up to 1 year and determined that they did not contribute to kidney disease. Interestingly, one showed that feeding impossibly high protein levels to cockatiels over one year led to some degree of fatty liver disease but no kidney problems. Now put the two together (kidney disease is common, and the old statements that high protein diets damage kidneys) and we have a hypothesis that has been around for years. You could say I wrote the veterinary chapter on bird kidney disease. This does not make me the end all expert, but I have read hundreds of studies on bird kidneys and can find no basis for the idea high protein diets cause kidney disease or gout. Also, there is no proof that low protein diets are protective. If anything, the bird kidney is very tolerant to both low and high protein diets. Dr Echols: The more common signs of kidney disease are also some of the most non-specific: drinking and urinating more often, lethargy and weight loss and rarely gout. These are all signs that say ‘go see your avian veterinarian’ but do not necessarily point to kidney disease. I always try to adjust the diet appropriate for the species (which usually means getting them off a high seed diet and sometimes lowering the percentage of pellets if they are the predominant food) rather than feed a ‘kidney diet’. Yes, I do like adding pharmaceutical grade flax seed oil (look for one that has a 3:1 omega 3:6 content) and give 0.22-0.44 cc/kg orally once a day. Emily: What about hypoproteinemia (is it also called kwashiorkor in birds? ): do you see that, ever? the vast majority of ‘total protein’ or ‘albumin’ lab measurements in birds are not accurate for avian species. At this point, we do not term hypoproteinemia ‘Kwashiorkor’ in birds. This term is used in humans that develop malnutrition from a lack of dietary protein. Parrot species in general are very tolerant of both high and low protein diets. in birds, aside from renal disease? And for that matter, how much of renal disease in parrots would you guess is directly caused by their protein intake? Dr Echols: While I have seen plenty of nutritional disease with birds fed protein only with no balancing mineral components (resulting in metabolic bone disease), those are issues with people feeding say hamburger only to a bird. Fortunately this is rare with most pet birds. As mentioned above, parrots are very tolerant to a wide range of protein levels in their diets. I would say that most nutritional problems we see in birds are not due to protein intake. Emily: It was my understanding that low protein diets cause poor feather quality. Do you believe that to be true? That’s not really a disease, per se, but it’s, you know, overall wellness. Dr Echols: Low protein diets in developing chicks can certainly cause problems. Human and dog studies suggest that protein malnutrition may be a risk factor leading to death when combined with certain diseases like some kidney disorders. We also know that low protein diets tend to increase the rate of strength decline in elderly humans. However with birds, the information is quite scarce once you get past young birds. I have said it several times that parrots seem tolerant of a wide range of dietary protein. I do think that long term protein malnutrition can be problem in pet birds. However, I am not clear on how low the dietary protein would need to be and for how long it would have to be fed before problems developed. We just don’t have that information yet. As more studies get published, this question will hopefully be better answered. Emily: What about food allergies, and grain allergies in particular? What’s the incidence rate there? Dr. Echols: While I do think there are true cases of food allergies in birds, they are extremely rare or we just don’t know how to recognize them. If birds have food allergies, they do not develop the reactions we recognize in mammals. As a result, our current diagnostics for allergies simply don’t apply to birds. Several people have studied allergy testing in birds which so far has not proven fruitful. Emily: Ok, so let’s broaden the scope from allergies alone to a more general question. There seems to be a lot of information indicating that corn, wheat, and soy are pro-inflammatory in humans, dogs, and cats. Do you find that these foods cause inflammatory processes in birds? Commonly? Uncommonly? Ever? Is it hard to say since so many birds are on a pelleted diet? Dr Echols: Based on what we know in other animals, processed grains very well could be inflammatory in birds. The problem is proving it as those same tests are not readily available in private practice or even studied at this time in parrots. So at this time, it would be very difficult to answer your question. Emily: How often do you see cloacal prolapse? And have you observed a common thread in the diets of these birds? Dr Echols: I see a fairly regular stream of cloacal prolapses (mostly male umbrella cockatoos and female birds with egg laying difficulties). I have not appreciated any relationship to diet but usually can find an association with other problems (behavioral issues and reproductive tract problems are most common). Emily: How often do you see scarring on GI tracts during necropsy? And have you observed a common thread in the diets of these birds? Dr Echols: Very uncommonly and I perform quite a few necropsies and submit tissues (including several parts of the intestines) for a pathologist to examine. So no common thread with diets recognized at this time. Emily: I think that pretty much wraps up my questions for now. Of course I’ll always have more questions, but for the moment, I got what I was after. Thanks again so much for taking the time to engage in this conversation! It was very helpful! Wonderfully helpful and fasinating conversation, thank you both for sharing! Dr Echols, you say that kidney disease is very common in birds. Do you know in general why this is? Do you feel it is diet related? Or some other consiquence of captivity? Is it as common in wild birds? Kidney disease is very common in many animals. In fact liver and kidney diseases are some of the most common probably because both organs actively filter so much blood. The liver generally processes blood (and subsequent infectious agents and toxins) from the intestines and the kidney eliminates protein wastes and filters the blood from the rest of the body. As a result, both organs get exposed to, and are susceptible to disease from, a large number of infectious agents and toxins. Kidney diseases are reported in wild birds (but trauma and infectious diseases are more common). Most of the kidney disease reports come from captive animals. Yes, the first thing you would do with a bird that has been on a bad diet is to make basic nutrition changes- as you suggested. Products like green tea, milk thistle, etc have shown promise with mostly preventing certain types of liver disease rather than treating disease. In other words, when you consider well done research the studies show some of these products have real benefit when you give birds the supplement before or at the same time a liver toxin is added. When you take an animal that already has liver disease and then add these herbals, the beneficial effects are much less (if at all). That is not to say they do not have value, we are just not sure how they have value. This is an area that deserves more research. No studies (that I could find) show benefit of using aloe to treat or prevent liver disease in birds. If you bird has liver disease, the first thing is to characterize it better (often more diagnostics such as a liver biopsy) before considering specific treatment. There is no one liver disease in bird and there is no one treatment. In fact, there are numerous types of liver disease most of which are managed or treated differently. I’ve read so many conflicting things about what to feed your parrot. I am overwhelmd by the amount information. I would specifically like to know about macaws diet. My understanding is that a macaw has quite different nutritional needs than other parrots, but I have been unable to find reliable information. Any help or guidance would be greatly appreciated. There is good reason to be confused! What specifically to feed a pet parrot is largely based on opinion (including mine). The other significant variable is the bird itself. The bird’s species, exercise level, reproductive status, environmental conditions and more all affect nutrient needs. For example a parrot flying outside will likely have significantly different nutrient requirements (vitamins, minerals, calories, etc) than one that spends most of its time in a cage. So there is no one diet for macaws- or really any parrot species. However, if you would like a general recommendation for most macaw species it would be the following: 50-70% pellets, lots of fresh richly colored vegetables, berries and a small amount of cooked grains. If you go under ‘Forms’ and ‘Foods for Different Avian Species’, you can see ideas about different veggies, grains and fruits. I would like information on how to cure a bird from mites. Please contact the Association of Avian Veterinarians (www.aav.org) for a list of bird specialists close to you.